Now that the kids can safely cross the street on their own, they’ve started to take over some of my jobs at the Farmers’ Market. Specifically, they buy the flowers each week. This particular week, since mom-person had come, 6 year-old No. 1 and 4 year-old No. 2 split up. No. 2 wanted to show mom-person around. No. 1 was more interested in carrying out her usual jobs. I handed her a 20 and asked how much change she should get back for the $5 flowers. “15 dollars,” she responded. “Be safe,” I admonished, as No. 1 headed out for the flower stand across the thoroughfare that divides the market so cars, (of all things), can drive through. I carried on with my shopping, getting a few particularly sweet cherry tomatoes, and taking time to check out the many vegetables that I have yet to learn the names for, navigating through the crowds that had clumped every so often for an apparently excellent offering of… whatever those were. When I made it back to where No. 1 and I were to meet, she hadn’t returned. Mom-person, No. 2, and two-year-old No.3 were waiting there, but No. 1 was nowhere to be found. I walked over to the flower stand at a leisurely pace to see what was going on. As I arrived, I beamed with pride. Lauren had invited No. 1 up and into into the stand to wrap her own flowers. The stands are constructed so that their concrete floors are two feet above the sidewalks in front of them. 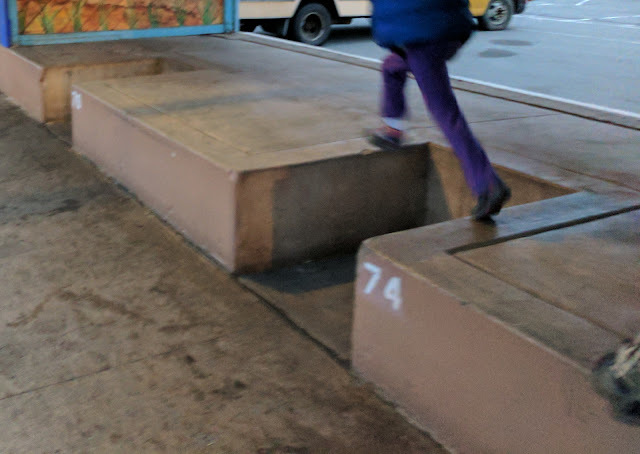 Each stand has two divots so the people tending them who don’t feel like standing above their customers all day can drop down to sidewalk level. “Yup,” she said, and the independent kid and I wandered off to find the rest of the family. What adventures have your kids had lately? I'd love to hear them!